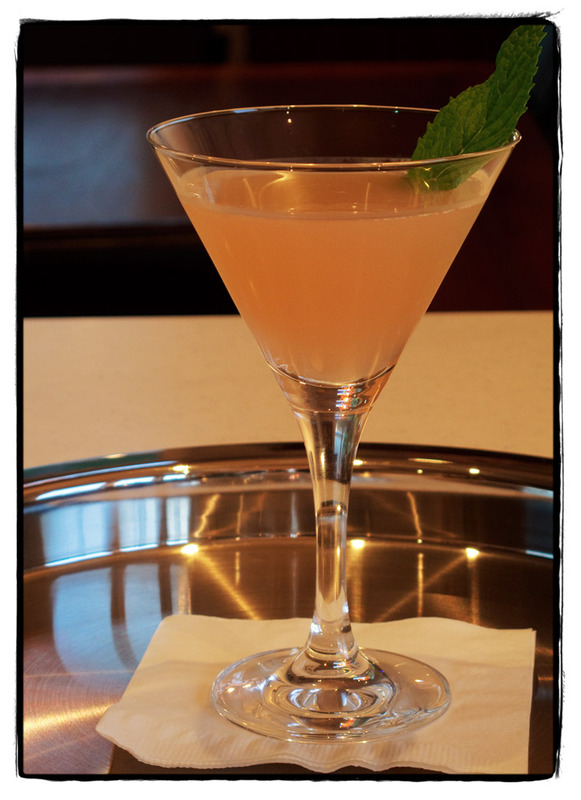 The darling of Hollywood and girls on the town everywhere , The Cosmopolitan features as our fourth drink. Unwittingly, we’ve found ourselves defending this on more than one occasion recently. We hope you take the time read about this classic cocktail in the the full Cosmopolitan feature. If Candice Bushnell can spare some time, we might get round to writing a story some time. Seriously, I thought I knew. Turns out you don’t know much until you start making your own spirits. And that’s what I’ve been doing. Lots of work has gone in to whiskey/whisky making and it’s getting pretty respectable. But I thought I’d chronicle my rum making. This is my third attempt, and while it’s much more forgiving than whiskey, it’s not without a few challenges either. Watch and learn. There will be plenty of mistakes along the way. It’s hard to believe it’s already been a year since we unleashed What Cocktail? on the world. There’s been some exciting triumphs (very briefly displacing Gordon Ramsey and Jamie Oliver for example) as well as being Gizmodo and TUWA‘s app of the day. Of course the very gracious Beautiful Pixels was one of the first to give us some serious support. One could accuse us of not being adventurous enough with our Mixology Mondays, but we’ve long-held the view that appreciating craft cocktails is esoteric enough for most folks and we should concentrate on doing a few things right. The thing we like to do right is describe the drinking experience for cocktails you actually have a chance of ordering at your local good bar. Coupled with the strong likelihood of inadvertently fanning the flames of a South American grudge match we thought we were challenged plenty. Those of who follow us will know that we like our drinks sour. 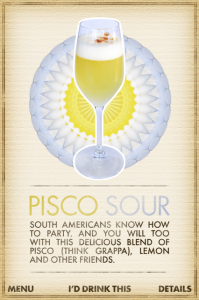 We’ve written about other members of the sour family before, but to be honest, our favorite is still the Pisco variety. It’s a drink that showcases the unique, musky, grappa like flavors of pisco. If you are new to this spirit, it’s from South American. The provenance is hotly contested by Chile and Peru where the manufacturing process differs somewhat . A debate that for the won’t be drawn into, except to say, we’ve had some lovely pisco from Chile and were very thankful that our friends brought it back for us. Shake over ice and strain into a champagne flute. Rather than garnish with the usual drop of angostura bitters we used Fey Brothers’ west indian orange bitters. Sounds simple, but what does it taste like? More sophisticated and gentle than a whiskey sour. Maybe it’s the champagne flute we serve it in, but there’s something elegant about how it tastes. At the risk of sounding crass, for the amount of alcohol involved (our pisco is 40%) and the small amount of sweetness, this drink is deceptively smooth. The hints of grape are unmistakable but not too dominant. If you are fortunate to have g00d quality pisco, then your night is set. We’re run out of ice, lemons, and egg whites before we get bored of the Pisco Sour. Sadly, if the spirit is second rate then we tend to move along after one or two. A sharp contrast to Margaritas where less than stellar tequila doesn’t dampen our enthusiasm. 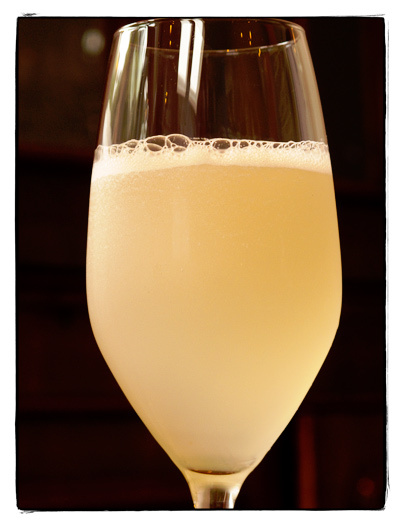 Being a classic drink, the Pisco Sour can be found in What Cocktail? for your iphone. It’s been known to show up at the most opportune occasions. This month’s Mixology Monday finds Chris at Spirited Remix asking us to put our humility aside and put forward our best drink. Sort of the opposite of cocktail guilty pleasures. 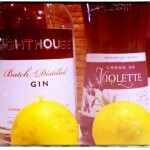 It should be an honest and original attempt to make a good drink – no hiding behind irony or kitsch. What’s surprised us was that we even had such a drink. You see, we’ve long held the view that, like typography, there’s so many excellent specimens created by some insanely talented people over the years that it would take a life time just to appreciate them much less meaningfully add to the pantheon. Strangely enough though, we do indeed have such a drink. It’s been our little secret and occasionally is it made and foisted upon unsuspecting friends. Most of the time we’ve just tinkered away and tried to make it better when we felt the urge. We’ve found that the best time to drink one is when you are feeling a little cheeky. Or maybe you’d just like a reason to be a little cheeky. Perhaps something to help you tell more jokes or become a little more chatty? We’ve named this drink The Flightless Cocktail in thanks to our good friends at Flightless with whom we created the What Cocktail? iPhone app. They’d politely asked if we could make it blue. A request we promptly ignored. This is a drink you smell first. Mint, lime, and passion fruit are all very exciting, and we think quite sympathetic to the nose. There’s a lightness and playfulness between the almond and lime tastes too. It’s important that the sweetness of the Amaretto and the tartness of the lime should complement. A strong sour taste is essential but it shouldn’t be too forward either. 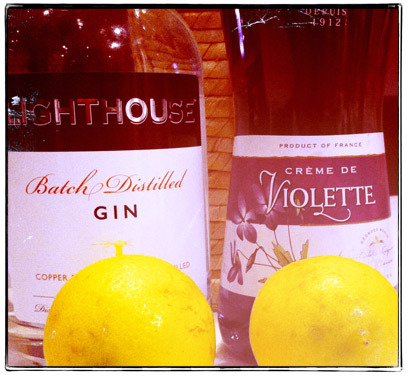 This balance is much the way that maraschino and violet work with lemon in an Aviation – perhaps another justification for the name. Here’s how we make The Flightless Cocktail. Add the ingredients to cocktail shaker filled with ice. Shake and strain into chilled cocktail glass, garnish with mint. We’ve experimented using fresh passion fruits (like the ones from our garden) and this can be quite tricky to get right and it’s very easy to go off into a whole world of sourness. We’ve also tried a few variations, tearing up the mint, using more Amaretto (not advised), using more passionfruit vodka (not advised), not using cranberry juice (looks muddy), and turning it into a fizz (acceptable, but a bit of waste). We’ve also expended considerable effort trying to find a spirit other than vodka that would give us the results we wanted. Gin, nope. Rum, even Havana Club is too heavy. Tequila, interesting, but that’s a whole other drink. Traditionalists, will tell you this is just a Cosmopolitan with Amaretto instead of Cointreau and some passion fruit flavouring thrown in. And they may have a point, but we like to think this little number is better mannered and will help people side step the unfair backlash of the Cosmo haters. We’re happy drinking our own creation in private, like it’s our little secret. If nothing else it provides an opportunity to compare and contrast and quite frankly a little passion with about drinking has got to be a good thing. We had planned on sneaking this drink into What Cocktail? with a super low probability of showing up. It was going to be a bit of inside joke and a nod to the team involved but ultimately it seemed a little too self-indulgent. Even for us. 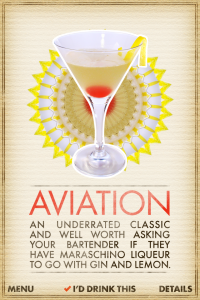 We’d love to hear what you think of The Flightless Cocktail. Edit: If you are curious, you can read about what other people created for MxMo. Anyhow, apparently the 22nd of February is National Margarita Day. Like most things involving tequila the details are a little hazy: it seems self-declared rather than official and it’s all a bit confusing as to whose nation is having it. 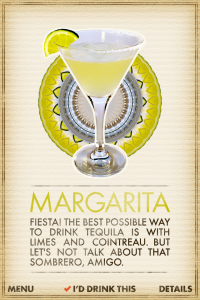 Personally, we are raising our cocktails glasses high in toast of what we consider “International Day of the Margarita”. Given that it’s Kim’s birthday as well (a happy coincidence if ever there was one) we suspect that the 23rd will be observed as International Day of the Hangover. To keep the fiesta going, we’ve also arranged for a special price drop for the What Cocktail? iphone app. For the duration of the festivities you can get the critically acclaimed, and much loved, app for USD$0.99 – the lowest Apple will let us sell it for. Get the What Cocktail? now. 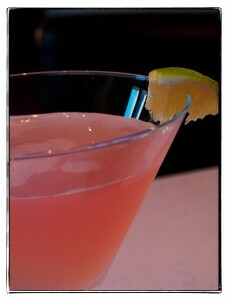 Once again we find ourselves intrigued by the topic of Mixology Monday. This time it is “Like that. 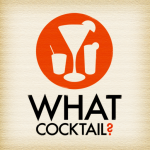 You’ll love this” hosted at the eGullet spirits forum. As the keen reader will know, drink recomendation is near and dear to our heart. We even cooked up an iPhone app to help with that, but this topic is intriguing from both a taste and an academic point of view. If you like a Lemon Drop (and we do! ), then you’ll love a Whiskey Sour. In many ways the only change is spirit, but what a difference that makes. Some other details change too, like the garnish. And the glass. And the fact that it’s served on the rocks. If we are playing compare and contrast, it may seem like crazy talk to try and move a Lemon Drop vodka drinker to a whiskey. Sure, one normally, one goes through all the clear spirits before playing with the aged rums, tequilas, and finally the whiskeys. But with this a great drink for people to get over their fear of brown spirits. 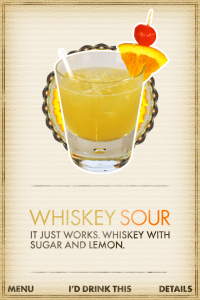 The Whiskey Sour, often mocked for being an old man’s drink, has lots going for it. It’s a bit manly, but also well behaved. It can be sipped slowly while waiting for friends to show up. 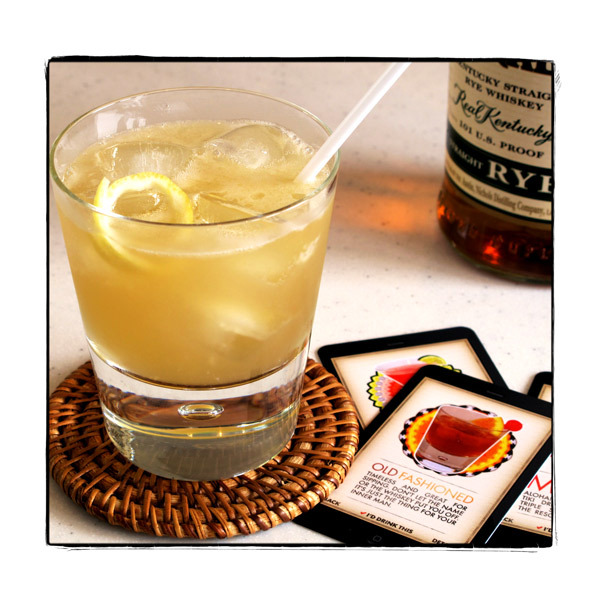 The sweetness can be varied without disastrous effects (it’s certainly more forgiving than a Lemon Drop), the lemon helps excite the taste, and the whiskey immediately shows what a difference a spirit can make to a drinks character. And that’s kind of the point of the whole exercise. Gaining an interest in spirits and their unique tastes go a long way to encouraging some cocktail exploration. half ounce of simple syrup. Shaken and served in an ice filled tumbler or strained into a sour glass. It’s too sweet, it’s made from corn mash, it’s from the South: three sterling reasons to stay clear. Big thanks to Chris at eGullet’s Spirits & Cocktails Forum for hosting. What a great theme. As for recommendations, have a look at What Cocktail? for the iPhone. It’s all about helping people explore different drinks based moods, time of day, and season. Some times it’s nice not having to choose. In case you are curious, here’s some of the write ups we’ve received. Beautiful Pixels completely got it. 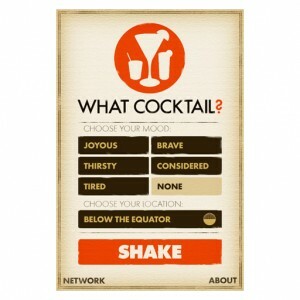 The app “What Cocktail?”, developed by flightless productions, helps you to find your perfect liquid companion within seconds, in a simple, mouth-watering interface and beautiful design. This made our week and their loyal readers have rewarded us with a few sales. Thanks again guys, you rock. 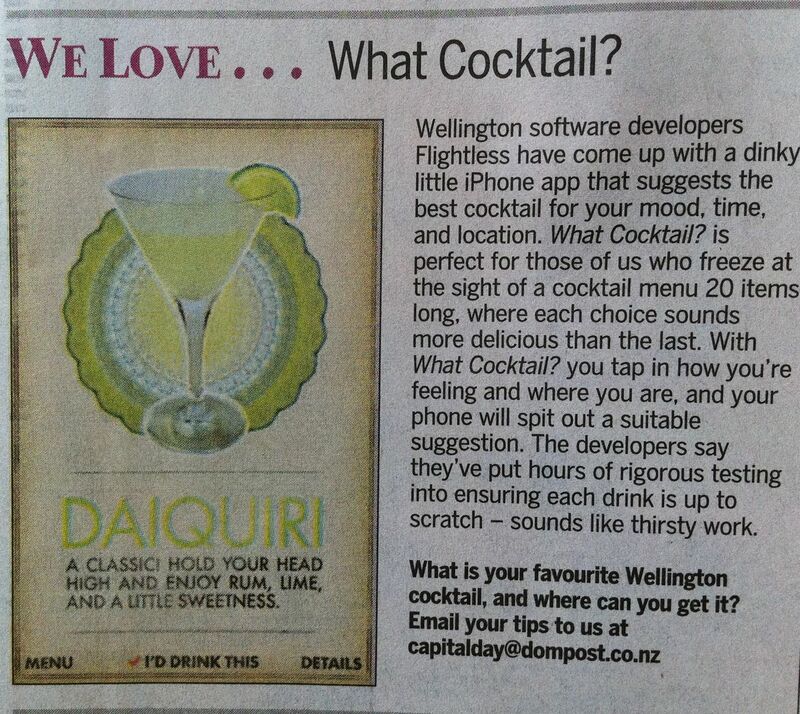 Some local media did a bit of spot on What Cocktail? and Flightless, which always nice to see. 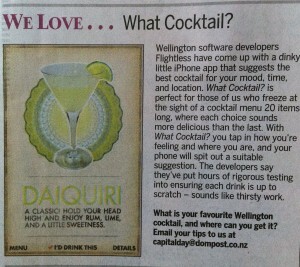 We even got a mention in the “Things we Love” section of the Dominion Post. (see attached). If you are a Facebook-y type person, then have a wander over to the What Cocktail page there and give it the old thumbs up! It’s finally out there! After all the hard work and all waiting for Apple to approve (which really only felt like a long time), What Cocktail? can now be purchased for your iPhone. Based around the drinks discussed here (and few more for good measure) it recommends a drink based on mood, time of day, and season. Flightless did an outstanding job. You can see why they win awards for their interactive work. The images look fantastic and it all works just the way it should.